Landless: What personality is this blog? I've done the personality analysis test a hundred times, and I always come up the same: INTJ, Introverted, Analytical, Thinking, Judging. However, today, I ran this blog, Landless, http://www.TonyNoland.com, through this website analyzer tool and came up with ESFP, Extroverted, Sensing, Feeling, Perceiving. "They live in the present moment, and don't like to plan ahead"
Are you kidding? When you Google "ant grasshopper fable", there's a picture of me next to "ant". Never was there a more introspective, cautious, thoughtful and analytical guy! 1. This blog is a complete sham. The personality that shines through it is utterly false, with no true relationship to who I truly am, which is the way I live my daily life. 2. My life is a complete sham. The personality that shines through it is utterly false, with no true relationship to who I truly am, which is the way I write on this blog. 3. This blog analyzer tool may or may not be a complete sham. I am a complex person with a complex personality. This blog, as an outlet for my more creative and lyrical efforts, shows one side of that personality, the most strongly ESFP side. The extent to which this is a small or large part of my overall personality can't be determined by an automated website analyzer. My blog came in as ESTP - The Doers. Wonder what the result would be without that werewolf post. It's based on a good classifier built upon a large dataset over several years. However, I suspect fiction posts throw it off. I think what pushed me into the Extroverted territory was the picture of my dog. Yep, dogs will do that. I think #3 is it. Just too complex. PS I don't have a dog on my blog. Do cats count? Melanie, I have a complete set of the Hornblower books on my shelf. Even with the cat vs. dog thing, I think "twin" is a decent description! Fascinating. I figured it'd be IMD - Introverted Manic Depressive. Heh. Thanks for the fun link. The gentle and compassionate type. Ha! What fun! I'm an ISFP - artsy-fartsy type. See Carrie above for more on the ISFP type. ME? I'm the opposite, an extrovert who shoots from the hip when someone threatens her Type A turf. But I think your blog fits your assignation quite nicely, sir. You have to separate Role from Identity. Your Identity might be INTJ, put your Role as a friend might require you to be a bit more spontaneous when good friends call up and ask you out for a beer. Same with your Role as a blogger. Some Roles require you to take on the behaviors of a different type which shows up in the style of writing. The MBTI is a behavior preference not a personality profile. It's like being left-handed or right-handed. You use both hands if it's required. 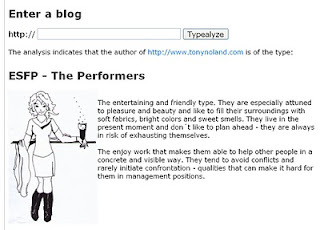 Typealyzer analyzes you in a specific Role, not your Identity. However, I still think Typealyzer is completely bogus. David: I checked the text it used for the analysis, and it included a FridayFlash story. Good call. Linda: Well, if the shoe fits, I guess I have to wear it! Shannon & Corin: I agree with you completely, so you must be right. This question always comes up about behavior and personality types. Am I introverted or extroverted, analytical or instinctive? It depends on context, doesn't it? What role am I being called on to enact? i very much enjoy your posting kind, very remarkable. don't give up as well as keep posting mainly because it simply just well worth to follow it. looking forward to browse more of your current stories, stunning day! www.tonynoland.com; You saved my day again. Wow, that is too funny. Yeah, search engines aren't human , and robots don't have the capacity to analyze like humans yet. It's always wise to take multiple tests to make sure you can get accurate results in your mind. Good thing you didn't only take that test or youd think you were an extrovert, ha!